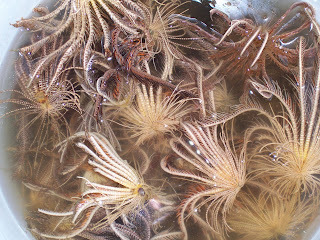 The Echinoblog: Crinoid Crazy!! Let's Meet Holopus! 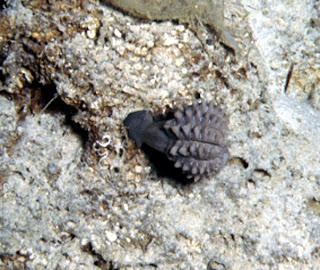 Crinoid Crazy!! Let's Meet Holopus! 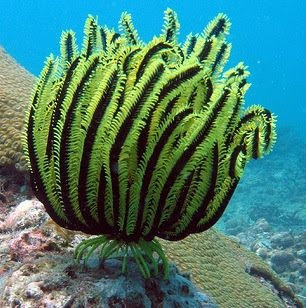 Today we feature the strangest of a strange and wonderous lineage of creatures- The Crinoidea!! Crinoids are suspension-feeding animals that capture food with their tube feet as water flows through their multi-branched arms. 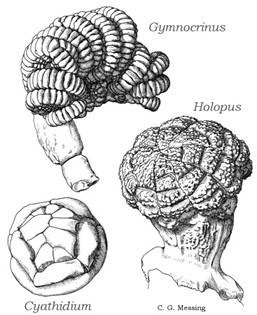 Crinoids are considered basal to the other living Echinodermata (i.e, they are the most "primitive" and show closer relationship to older extinct echinoderms). Modern crinoids occur primarily as unstalked forms, aka "feather stars"-the Comatulida, that can occur in the deep-sea but also in tropical shallow-water habitats. 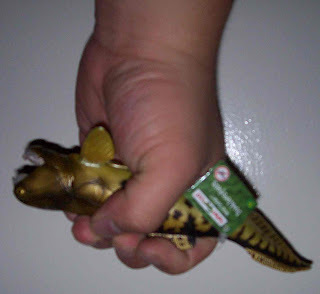 They are mobile and can be very brightly colored. but then, there's THESE weirdos. These are weird beasties in the family HOLOPODIDAE (Cyrtocrinida) that are kind of an odd intermediate form. 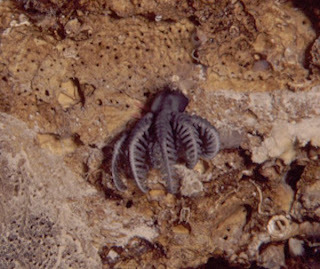 They live in the deep-sea (~100-900 m)and lack a full stalk, with five stout and stocky arms (other crinoids can have many more) but are cemented permanently to the substratum. 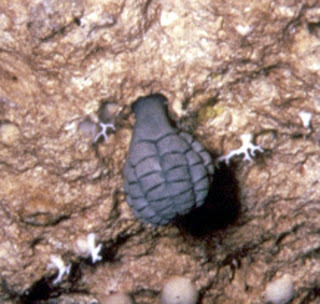 *H. rangii lives upside down on rocky overhangs. *Arms seldom open, but when they did, they formed a funnel-like array, taking 0.8 to 1.0 seconds in response to stimuli (either the bow wave or possibly the lights from the submersible). As a model think of it as a living crinoid fist! Opening and then closing! Three of a Kind: What?? They're all the SAME?? Blastoids from Belgium-the Music Video!